Software architect, developer, mentor, remote worker, blogger. Why does Britain – particularly England – grind to a halt at the first flake of snow? Some of it, of course, is down to people being pathetic but the fundamental reason is clear – we’re just not set up for it. However one has to question whether we should be. Snowfall in the UK varies wildly depending on where you are but it’s a rare year that we have more than 2 weeks which are seriously disrupted by snow – 3.8% of the year. How much do we really want to invest in such a small percentage of our time? Other (similar) countries don’t grind to halt because they have enough snow to make investment worthwhile. Finland is under snow, depending on where you are, for between 3 and 6 months of the year. To make this clear we’ll look at some of the cheaper and reasonable precautions one can take. Get some long life / tinned / frozen food in. Make sure you have a good supply of fuel – wood, coal, gas, oil etc. Most people have a garden spade, it’s useful to have one in the car (whether this be the garden spade or a “travel shovel” specifically for the car). Carry a couple of pieces of old carpet and perhaps planks of wood in the car. Maybe even specialist grip mats. Make sure your screen wash is full and mixed up correctly for winter. You can buy concentrated screen wash at good motor factors, mix it up as per the instructions for winter. Make sure you have proper boots that can cope with snow (good wellies will suffice). Get some grit-salt in for your path and/or drive. It’s not expensive. You can use dishwasher salt or even table salt but they tend not to come in big bags for a couple of quid. If you haven’t got (enough) salt then sand, grit or even ash will help. It freezes into the surface making compacted snow more grippy. These reasonable precautions won’t cost much. Motorists in Scandinavia however use Winter tyres. Even if you have a modest car that’s £300 and unless you’re going to pay someone to change them twice a year you can add the cost of a second set of wheels to that. What’s more unless you do a lot of miles the tyres will probably perish before they run out of tread which just wastes money. They do make a real difference to driving on snow (in fact they have specific snow tyres in Scandinavia which are even better). For 4% of the year though where they make that real difference is it worth it? That’s one simple investment we could make in our own cars but it highlights the issue rather well. Similar disproportionate investment would be required in much of our infrastructure if we were going to just carry on as normal in the snow in the same way that Scandinavian countries do. For 4% of the year it’s simply not worth us making those investments. It’s actually more cost effective for us to just to do the best we can with the limited resources available. 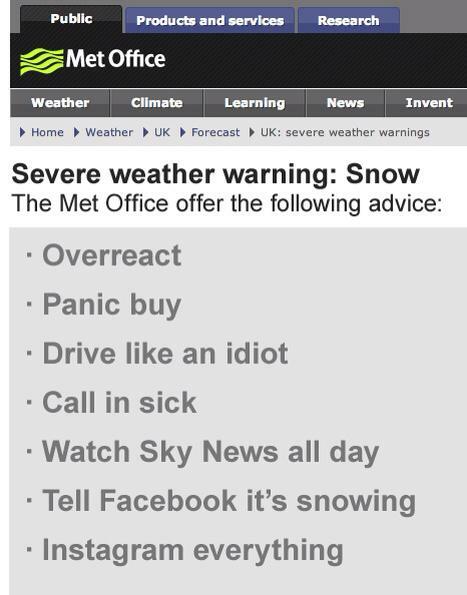 The key to dealing with snow in the UK is planning. We know it’s going to happen for a few days a year and the weather forecasters are rarely caught out by it, so plan in advance. Businesses should also be aware of the problems and should have plans. It’s all common sense. This entry was posted in Life on 2013-01-18 by Tom Fosdick.